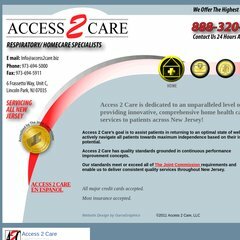 www.Access2care.biz - Welcome to Access2Care! Age: It went live on June 18th 2004, making it over 13 years, 9 months old. ns28.1and1.com, and ns27.1and1.com are its DNS Nameservers. It is hosted by 1 1 Internet Inc. Pennsylvania, using Apache web server. Access2care.biz's server IP number is 74.208.27.129. PING www. (74.208.27.129) 56(84) bytes of data. A time of 0.821 ms, is recorded in a ping test.